slrc » What is a sea louse? When we think of lice in the conventional way, we usually think of small six legged insects that either eat our garden plants in the summer or even worse, take shelter in the hair roots of our beloved young ones, causing irregular pattern of itching and scratching. Although sea lice do have a lot in common with insects, they are in fact not insects at all. On the contrary, sea lice are natural small ectoparasitic crustaceans that spend almost their entire life living and feeding of the mucus, skin and blood of marine fish. In small numbers, they are generally quite harmless except for being itchy. In greater numbers however, they can cause stress, open wounds and severe damage to the host fish that can result in mortality. There are more than 500 different species of sea lice. A few species from the genera Caligus and Lepeophtheirus, however, are more important to us then others as they infect wild and farmed salmonid fishes around the world. While Caligus rogercresseyi is mostly a concern in fish farming in the Southern Pacific regions such as Chile, two subspecies of the salmon louse Lepeophtheirus salmonis create large problems for both farmed and wild salmon populations particularly in Northern Atlantic regions such as Norway and to some extent in the Northern Pacific regions such as Canada. 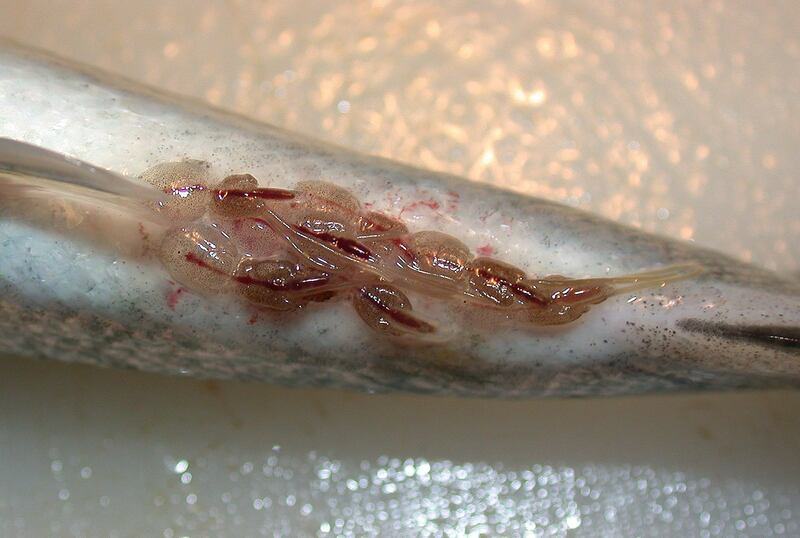 The Pacific sub-species of the salmon louse L. salmonis onchorynchi is host specific, that means only attack specific species, to pacific salmonids such as the coho salmon, pink (humpback) salmon and the sockeye salmon. The other sub- species L. salmonis salmonis is host specific to the Atlantic salmon, sea trout and rainbow trout. Can salmon louse infect other fish species than salmonids? The salmon louse is very picky and infects salmonids only. It does not infect fish species such as cod or wrasse. However, there is a large diversity of sea lice species infecting many different host species that resemble salmon louse. The cod louse (Caligus curtus) is most frequently found on codfish such as cod (Godus morhua), saithe and pollock. The male cod louse is bigger than the female in contrast to the salmon louse. Another sea louse Caligus centrodonti is common on different types of wrasse and is typically less pigmented compared to other sea lice to blend in on its colourful host. While some sea lice are host specific like the salmon louse, other types such as Caligus elongatus is non-host specific and can attach and infect at least 80 types of different fish species. The female louse of C. elongatus and C. centrodonti seen in this picture carry egg strings.